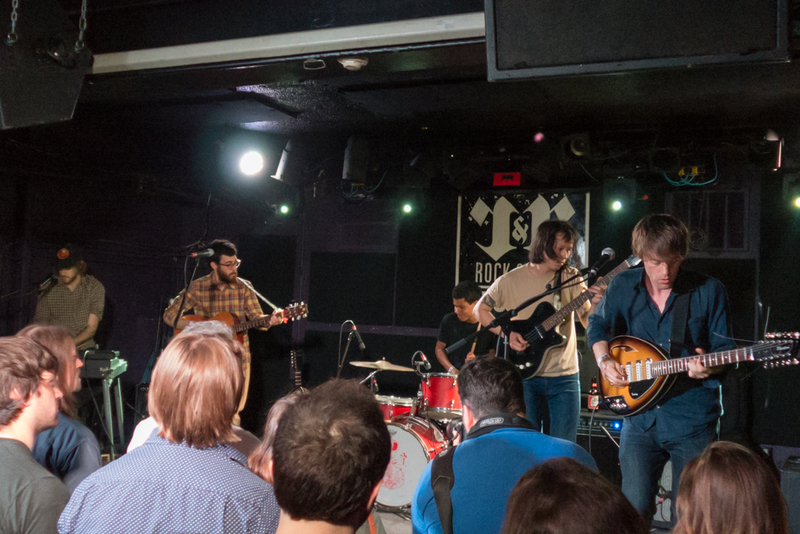 It wasn’t accidental that two bands that each have produced one of the best albums released so far in 2014 played last night at D.C.’s Rock & Roll Hotel, for Quilt and Woods are, at present, joined like family members. Woods’ Jason Taveniere produced Quilt’s second album, Held In Splendor, and on this tour at least, Quilt drummer John Andrews plays organ with Woods. 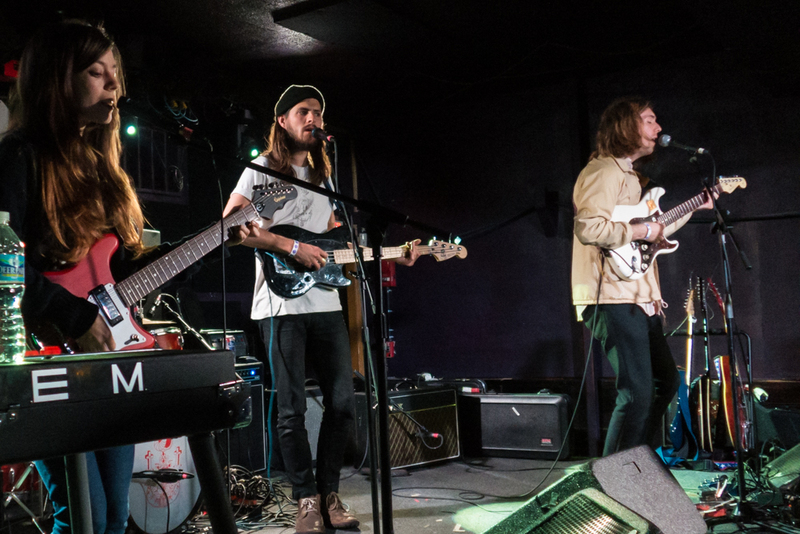 They have more kin connections than a village in West Virginia, and the show last night was one long stream of gorgeous melodies, guitar wizardry, a solid backbeat, and the occasional psychedelic rave-up. Quilt wrapped us in Held In Splendor, their warm and radio-ready platter o’ harmonic convergence punctuated by intricate pop finger picking and gritty power chords. Anna Fox Rochinski is a lyrical lead guitarist and an understated, somewhat shy front-woman, but when she and Shane Butler matched their vocal interplay with guitar fire, it brought to mind favorite two-guitar bands like Luna, the Soft Boys, even Television. Quilt’s sound is jangling ’60s pop with three-part harmonies contained within the parameters of garage, folk, and psychedelica, which is pretty great territory to ply. In fact, their new album is desert isle material, and the set last night proved they can do it live every bit as powerfully as in the studio. Quilt, Leica C, via the Rock & Roll Hotel’s mirror. 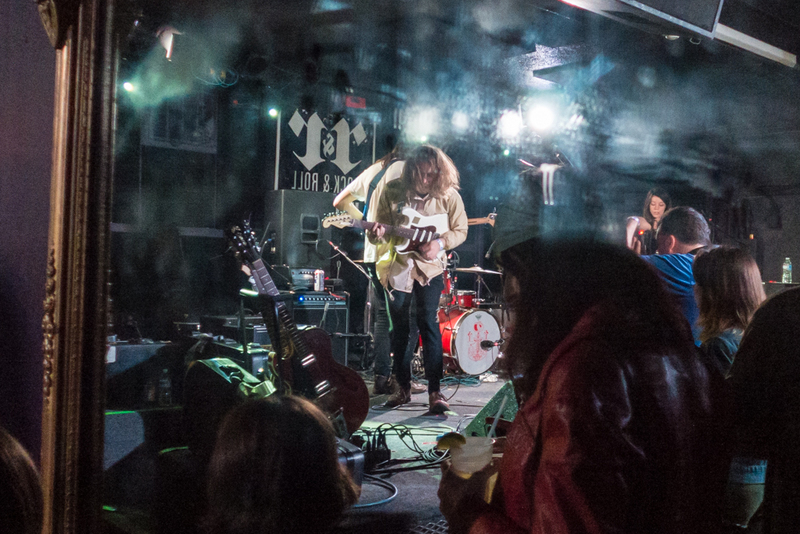 The crowd’s reaction to the best songs — “Mary Mountain,” “Just Dust,” “Tired & Buttered” — proclaims Quilt has, by their sophomore outing, established themselves as one of a handful of American bands worth tracking as they rise to what, should the cosmic order be proven, can only be inevitable world conquest. Since the release a few weeks ago of Woods’ With Light And Love, we’ve concluded it is every bit the equal to Bend Beyond, which some will remember we called 2012’s best album, and even more than that: an absolutely perfect record. It should go without saying, this is a hard feat to pull off once, never mind twice. But With Light And Love is astonishing — even prettier than its predecessor, and last night, despite a bad sound mix from the club, Woods revealed just what a treasure they’ve become. The new bass player, Chuck Van Dyke, steps well into Kevin Morby’s shoes, and with Quilt’s John Andrews playing organ throughout, Woods’ sound had an emollient undercurrent that was as surprising as it was delightful. They started out with “Leaves Like Glass,” which on the album sounds like an outtake from a mythic Dylan set and last night sounded like it was a jam in Memphis’ Ardent Studios. Jeremy Earl played acoustic through the early songs, including “Cali in a Cup,” but it was later in the set, when he had strapped on his electric guitar to play two of the highlights from the new album — “Moving To The Left” and “Twin Steps” — that it became clear how, even as amazing an album as Bend Beyond was, With Light And Love takes a giant step into the commercial mainstream, which we mean as a compliment. They played the title tracks to both recent albums, which means 20 combined minutes of getting your head scalped, and we survived the pyrotechnics, a groggy smile on our putzes. But it’s where Woods now confidently step into well-crafted pop songs that perhaps the band’s hidden ambitions begin to see the light. A clue to the ground they currently occupy can be found on the sequencing on the new album of the songs “Full Moon” and “Only The Lonely.” On the former, Jason Taveniere plays George Harrison-inflected slide, and the latter is the title of a different Roy Orbison song. Are they trying to emulate The Traveling Willburys? No, they’re still a Brooklyn-based band of artisanal pop craft, still weird and wooly, though it could be said that invoking Roy Orbison is one way of placing Jeremy Earl’s astonishing voice, his high plains croon, in a more recognizable context. We’ve seen Woods three times in 18 months. In November 2012, when they played across the street at the old Red Palace, it was like seeing Sun Ra come back to Earth, fireworks going off in the mind. Last night, with a new bass player and the sound of an organ ladling sweet honey on the guitars, the band was every bit as remarkable, but in a way that those with less adventuresome tastes could relate. How delightful it is to see two so great bands in a club with a couple of hundred souls. It’s only because of the injustice of life that we would see these bands on the H Street corridor and not downtown at the Verizon Center. Optimists that we are, we think both bands will get there. This entry was posted on April 27, 2014 at 2:43 pm and is filed under Music with tags DC, Quilt, Rock & Roll Hotel, Woods. You can follow any responses to this entry through the RSS 2.0 feed. You can leave a response, or trackback from your own site.